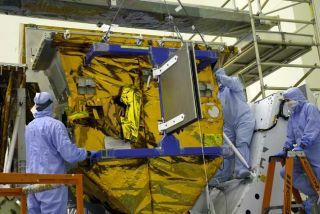 Technicians working at NASA's Kennedy Space Center maneuver a protective cover over a Fine Guidance Sensor destined for the Hubble Space Telescope. Astronauts will install the upgraded pointing instrument during STS-125. NASA closed its Florida spaceport early Monday to protectits space shuttle fleet and other vital hardware from severe weather associatedwith Tropical Storm Fay. The storm is expected to make its closest approach to theagency?s Kennedy Space Center (KSC) in Cape Canaveral, Fla., on Wednesdaybetween 2:00 a.m. and 8:00 a.m. EDT (0600 and 1200 GMT), though forecastersexpect heavy rain and strong wind to begin in the area today at about 2:00 p.m.EDT (1600 GMT). "At least six inches is anticipated during thistime," said NASA spokesperson George Diller in an update. The storm also prompted NASA to delaymoving the space shuttle Atlantis, scheduled to launchOct. 8, from its service hangar to the giant Vehicle Assembly Building atKSC, where it will be fitted with its fuel tank and solid rocket boosters.Officials expect to be able to move the 100-ton spacecraft as early as Thursday,and the delay shouldn't affect the shuttle's planned launch toward the HubbleSpace Telescope. Tropical Storm Fay hit Florida's southwestern coast Tuesdaymorning and is currently moving in the north-northeast direction at about 9 mph(15 kph). As of 8:00 a.m. EDT its maximum wind speeds were 60 mph (95 kph),according to the National Weather Service. To ensure the safety of its space shuttle fleet, NASA hassecured all three shuttles in their hangar-like Orbiter Processing Facilities.The vehicles are powered down in their hangars with their payload bay doors closedto protect against any damage. Hardware for Atlantis' upcoming mission toHubble and future flights to the International Space Station has also been protectivelycovered. The space center plans to be closed for about 24 hours.During this time most of KSC's almost 15,000 employees will not be at work,though a team of about 200 emergency personnel, known as the "ride-outcrew," will stay to protect critical hardware and operations, NASAofficials said.